With so much sadness, snarkiness and politics on social media, it's sometimes hard to find the silver lining. 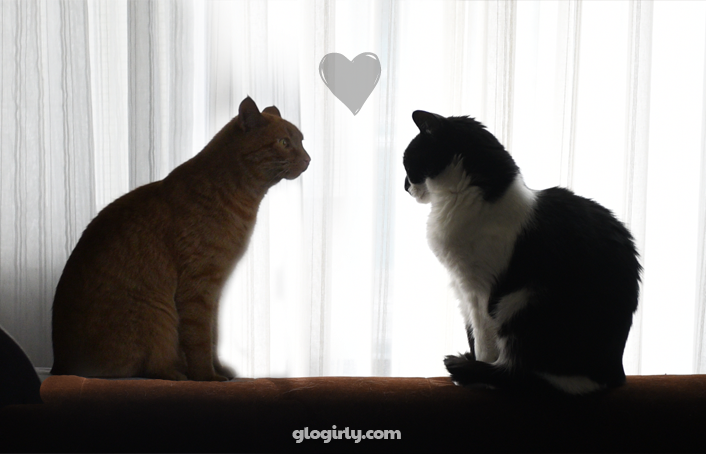 But yesterday a friend posted a challenge to Glogirly and a few other cat loving bloggers. The challenge is quite simple really. Just post a picture of your happy pet. Something to spread a little smile. And to remind ourselves how truly transforming adopting a rescue animal can be. They say that adopting a pet impacts two lives. The life of the animal and the life of the adopter. But we believe it can mean so much more and reach farther than you'd ever expect. Gloman adopted Katie in September of 2005 as an anniversary gift for Glogirly. 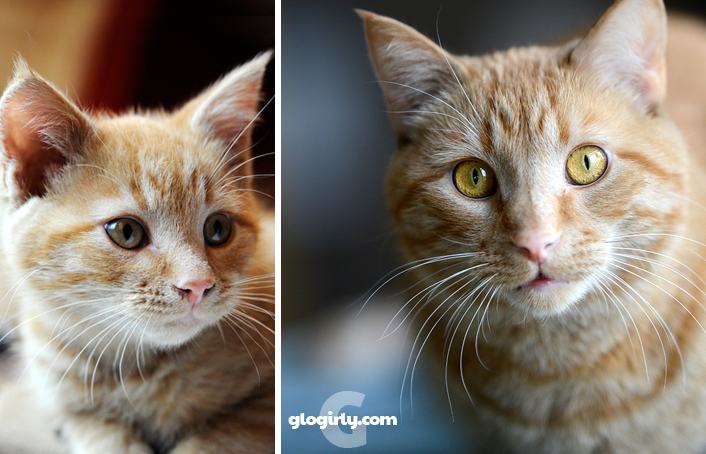 It had been many years since Glogirly had a cat and to say it was love at first sight is an understatement. It was Katie's voice Glogirly heard when she wrote her first blog post ten years ago. Katie was the inspiration behind it all. 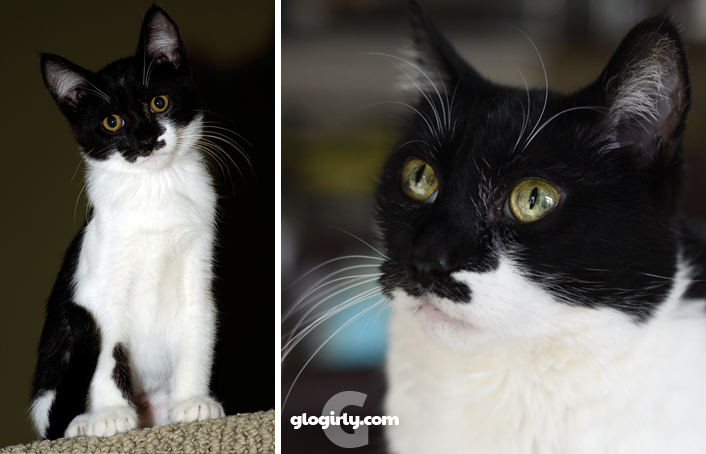 If Gloman hadn't come home with a tiny bundle of black & white fur all those years ago... well, we just can't imagine. We'd have not met all of you, our dear friends and readers. We'd have not met hundreds of wonderful pet bloggers from all corners of the world. We'd have not been able to donate thousands of dollars in prizes, supplies and cash to help no-kill cat shelters. Even Glogirly's design business began right here on the blog. And it all began with a tuxedo kitten named Katie. Our favorite mischief maker came to be as a result of our blog too. "Waffles" began as a character on the blog. A made-up sidekick for Katie. He was just a cute stock photo Glogirly started Photoshopping into graphics for the blog. She made up his goofy personality, his innocent and curious voice, and in a very short time found herself in love. On a late Saturday night in November of 2012, she opened up her laptop and went to Petfinder.com. She entered our zip code, clicked search and there he was. The cutest orange kitten she could imagine. She drove to the Humane Society in Buffalo, MN the next morning and brought him home. She never imagined that his personality would be EXACTLY how she's written him. Our family just wouldn't be complete without Katie, Waffles and all of our beautiful friends and readers. Thank you for sharing your time with us. Our message is a simple one. Adopting a rescue pet can impact so many lives for the better. If you have room in your heart and home, please consider adopting from a local rescue shelter. If you have time to give, please consider volunteering at your local shelter. If you have resources to give, please consider donating to your local shelter. If you have love to give, please consider fostering. The lives you save, the lives you touch, can create a magical ripple effect. Animals really do make our lives complete. Brilliant We love you both. What a special post. Maybe my human will go back to volunteering occasionally at one of local rescues. Adopting a rescue pet also saves another life -- the next dog or cat in the shelter who's going to die because they need space! We agree with everything you've written! 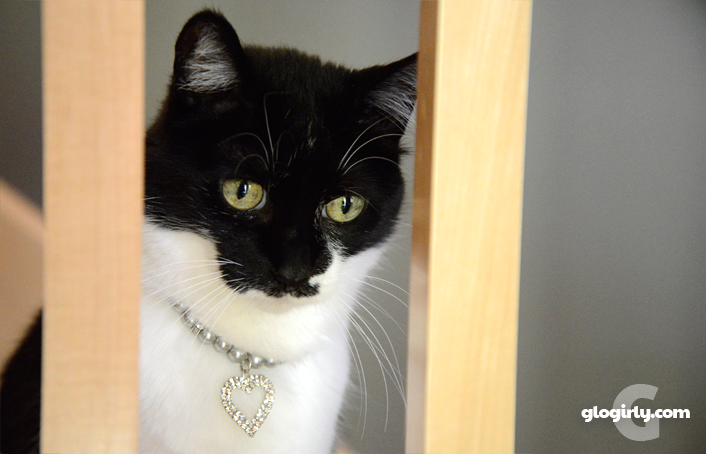 When we brought in Lucy, we never imagined how our hearts would expand as she blossomed in personality. Someone's left-behind cat has become our treasure. Mum is happy that you took the challenge. We are happy to have you as our furiends.Love and adopt a shelter cat, save a life or two. How heartfelt! I would say adopting a shelter pet saves at least THREE lives, including a bundle of fur who will not be turned away at the shelter because they now have an empty cage to fill. I smile to think of the kitty who had to fill MY shoes at the CAP shelter. BTW, I love the lead pic and little kitten Katie. Aw...what a sweet post. This is one of the reasons why our mom volunteers at our local shelter. She sees the sweetest cats there just waiting to make some human happy. Oh, this is just pawtastic! Our mom's life would be so different if she didn't adopt us. She has gone so many places, made so many new friends, and has learned so much. She has even transported cats to their new forever homes. We wish every pet in the world could have a forever home like ours. It's like you were meant to find Waffles...that's why you imagined him in your head! That is a great story about how Katie and Waffles came into your lives. Baby Waffles and Katie pictures!! <3 Adorable. I remember you hesitated to shake up Katie's world by bringing another cat into your home. Best decision ever for you and Gloman, Katie, and all of us!